Habit: Shrub < 20 dm, green-glabrous to silver-hairy. Stem: erect. Leaf: cauline; stipules 8--12 mm; petiole 2--3(6) cm; leaflets 5--12, 20--60 mm. Inflorescence: 10--30 cm, flowers whorled or not; peduncle 4--10 cm; pedicels 4--10 mm; bract 8--10 mm. Flower: 14--18 mm; calyx upper lip 5--9 mm, 2-toothed, lower 5--7 mm, entire; petals generally yellow (lilac to purple, especially north of central NCo), banner back glabrous, spot darker or not to white, keel upper margins ciliate claw to tip, lower glabrous. Fruit: 4--7 cm, brown to black, hairy. Seed: 8--12, 4--5 mm, black to tan, often striped lighter. Ecology: Coastal bluffs, dunes, or more inland; Elevation: < 100 m. Bioregional Distribution: NCo, CCo, SnFrB, SCo, ChI (probably naturalized n of Sonoma Co.). 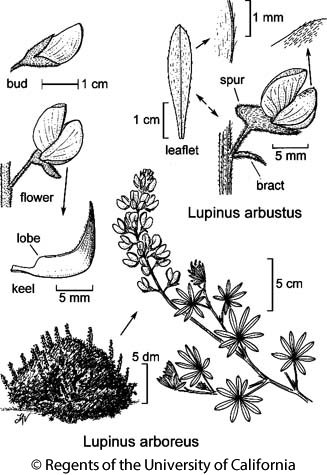 Flowering Time: Apr--Jul Note: Grades +- into Lupinus rivularis in NCo. Plants with yellow petals, sweet-smelling flowers widely cultivated as sand binder. If recognized taxonomically, hairier plants from western SnFrB (yellow banner, blue wings) assignable to Lupinus arboreus var. eximius (Burtt Davy) C.P. Sm. ; plants with glabrous leaflets, purple petals assignable to Lupinus propinquus Greene (study needed). Unabridged Note: If recognized taxonomically, hairier plants from western SnFrB (yellow banner, blue wings) assignable to Lupinus arboreus var. eximius (Burtt Davy) C.P. Sm., plants with glabrous leaflets, purple petals assignable to Lupinus propinquus Greene; study needed. Citation for this treatment: Teresa Sholars & Rhonda Riggins 2012, Lupinus arboreus, in Jepson Flora Project (eds.) Jepson eFlora, http://ucjeps.berkeley.edu/eflora/eflora_display.php?tid=31731, accessed on April 22, 2019. NCo, CCo, SnFrB, SCo, ChI (probably naturalized n of Sonoma Co.). Markers link to CCH specimen records. Yellow markers indicate records that may provide evidence for eFlora range revision or may have georeferencing or identification issues. Purple markers indicate specimens collected from a garden, greenhouse, or other non-wild location.